With the CAN module (PIPCAN) you can easily add an internal isolated CAN 2.0 interface to the PIP. It supports CAN 2.0B standard and is based on the Philips SJA1000 CAN controller. The solution is installed inside the PIP with various mounting options. The interface is accessible on a standard DB-9 connector on the PIP front. The module can be mounted into every PIP housing. The combination of a PIP and PIPCAN module is a complete, compact and clever solution for industrial applications that require a CAN interface. 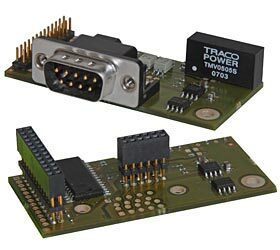 The PIPCAN module can be used in all Celeron M, Pentium M, and CoreDuo based PIPs equipped with the internal CAN extension connector. For example, it works on the PIP9-11, PIP10-1, PIP11-1, PIP20-1, just to name a few. The PIPCAN-1 occupies the optional Serial 2 port for RS232/ RS422/ RS485 via SERIF module. Therefore with the PIPCAN-1, only one additional SERIF module can be used. If two SERIF modules are required please select an other PIPCAN version then the PIPCAN-1. The PIPCAN-1 may conflict with an additional first PC/104 module. Please check the mechanical mounting of all additional modules and select the PIPCAN version that fits your needs! Isolated CAN module can be added into all Celeron M, Pentium M, and CoreDuo solutions. Interface externally accessible on Serial-2 DB-9 connector of the PIP. Module fix mounted on PIP board. Caution: Occupies optional Serial 2 port. Isolated CAN module can be added into all Celeron M, Pentium M, and CoreDuo solutions. Interface externally accessible on additional DB-9 connector anywhere on the PIP front. Module is mechanically mounted on PIP front via DB-9 connector.